Home > Parasitic Infections > Babesia SPP. Exposure: tick exposure, blood transfusion, or both. Morphologic, serologic, or molecular evidence of infection. The members of the genera Babesia and Theileria are protozoan parasites. These organisms are of medical, veterinary, and economic importance. 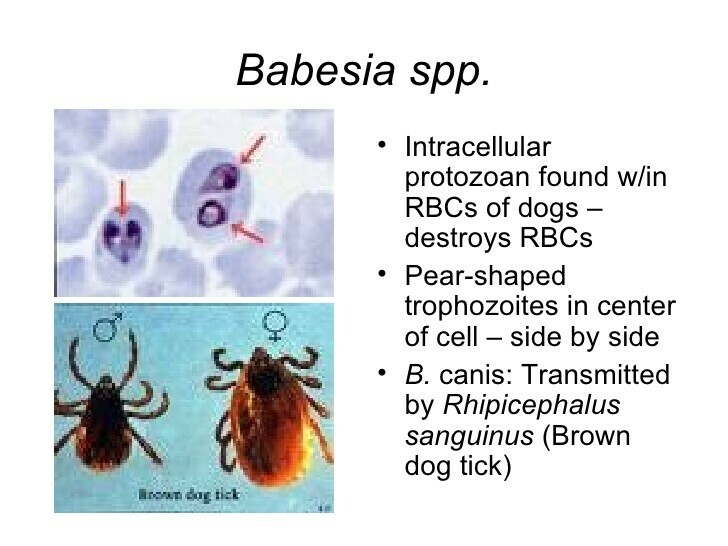 Babesia species cause disease in humans and animals. The genus Theileria is the etiologic agent of cattle fever in Eurasia and Africa; it has also been implicated in human disease. Common to both genera is an intra-erythrocytic phase. These organisms develop pear-shaped intra-erythrocytic ring forms and are therefore referred to as piroplasms. An exo-erythrocytic schizont stage has been demonstrated only for Theileria species. Babesia species were first discovered in cattle in 1888, and they were subsequently found to be the etiologic agent of Texas cattle fever. Human babesiosis was first definitively demonstrated in a splenectomized Yugoslavian cattle farmer in 1957. Babesia divergens, a cattle parasite, was the species implicated in this infection. This particular organism causes severe and fatal infections in Europe, in splenectomized individuals. This is in contrast to babesiosis in the United States. Babesia species are highly endemic in the northeastern portion of North America, but infections have been reported from the southern, midwestern, and western United States. Unlike babesiosis in Europe, infections usually occur in normosplenic individuals and are usually caused by the smaller parasite B microti. This parasite is predomininately maintained in a white-footed mouse (Peromyscus leucopus) reservoir, but other small rodents may also be infected. 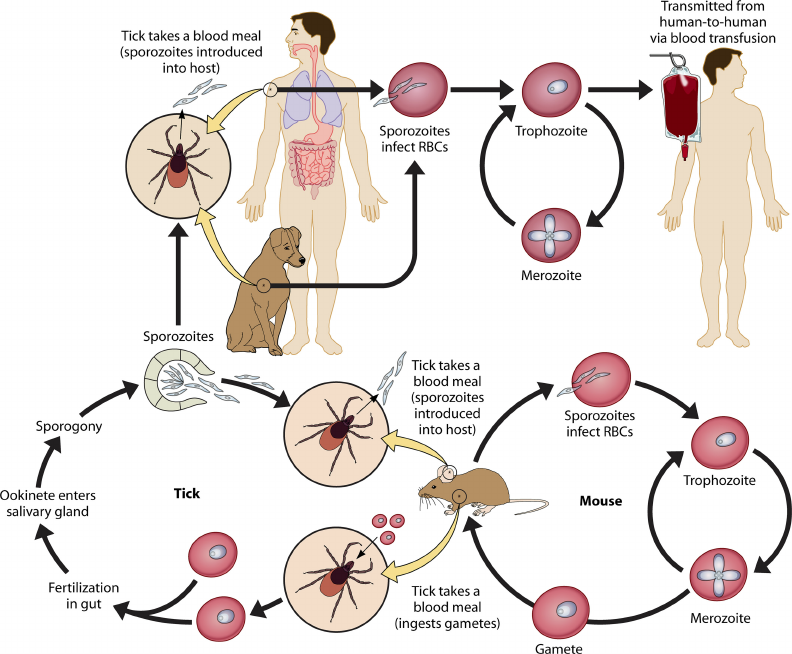 B microti is transmitted from mouse to mouse and from mouse to human by the hard-bodied tick (Ixodes scapularis, previously known as I dammini). Trans-stadial (stage-to-stage) transmission occurs within the tick, but transovarial passage has not been demonstrated. The larval and nymph stages of I scapularis typically feed on small rodents and thereby acquire the Babesia parasite. The predominant host for the adult Ixodes tick is the white-tailed deer. Deer are not infected by B microti, but the expanding deer population may contribute to the distribution of both the tick and parasite. This tick vector and the mouse reservoir also harbor the etiologic agent of Lyme disease, Borrelia burgdorferi (site), and the agent of human granulocytic ehrlichiosis (site). A new species of piroplasm, WA-1, has more recently been associated with human infection in the western United States. This organism is antigenically and genotypically distinct from B microti. Genotypic data suggest that this species may be more closely related to B gibsoni, a dog parasite, or the Theileria species. Presumably, a tick vector is also necessary for natural transmission, but this has yet to be established. In North America, the majority of Babesia infections are asymptomatic, but severe and life-threatening infections are documented (Box 4). The symptoms in most mild infections are nonspecific and include myalgia, malaise, low-grade fever with chills, fatigue, nausea with or without vomiting, and headache. Severe manifestations probably reflect host susceptibility rather than parasite virulence. The manifestations of severe infection include exacerbations of the symptoms noted above, as well as hemolytic anemia. These patients may be jaundiced and develop dark urine secondary to intravascular hemolytic anemia. Severe manifestations occur more frequently in splenectomized, elderly, or immunocompromised individuals. Coinfection with B burgdorferi should be considered in patients with babesiosis. Borrelia species, which cause relapsing fever and Lyme disease, are also transmitted by the Ixodes tick. There is also extensive geographic overlap in the distribution of Borrelia species and B microti. Krause et al studied patients infected with either B microti or B burgdorferi and compared them with patients coinfected by these organisms. They found that patients coinfected with B microti and B burgdorferi have longer and more severe disease than patients infected with B burgdorferi alone. In animal models, Babesia species are known to cause immunosuppression. Similarly, coinfected subjects have evidence of elevated spirochetemia. The exacerbation of symptoms found by Krause et al could conceivably result from transient immunosuppression by Babesia species and a subsequent increased spirochetemia. The cattle-associated parasites B divergens and B bovis cause human babesiosis in Europe. In this region, splenectomized individuals are at increased risk for infection by these organisms. These patients develop a severe hemolytic disease and have a high fatality rate. Wright- or Giemsa-stained, thick blood preparations may be used to detect the presence of parasites. Thin blood smears are then used for morphologic studies. Most commonly, nonspecific ring forms are present, which must be differentiated from a Plasmodium species (see Plasmodium section above). Rarely, the parasites may appear as the characteristic "Maltese cross." This consists of a tetrad of merozoites and is pathognomonic for Babesia species. Magnetic resonance imaging or computed tomography scan of the abdomen may identify nonspecific changes in the spleen. The nonspecific symptomatology seen in patients with babesiosis may also be seen in a wide variety of infectious diseases. Important etiologic agents in the differential diagnosis of tick-borne disease include Rickettsia rickettsii and other spotted fever group rickettsiae, B burgdorferi and other Borrelia species, Ehrlichia chaffeensis and Ehrlichia canis, and the coltivirus responsible for Colorado tick fever. Infections by these organisms often lack characteristic physical examination findings, and the definitive diagnosis may rely solely on laboratory findings. If the tick is retained, identification may be useful in limiting the differential diagnosis. Most infections are asymptomatic, and complications are rare. Complications are more likely in immunocompromised hosts, the very young, and the elderly. Complications include an exacerbation of an already weakened state, severe hemolytic anemia and the sequelae thereof, or, rarely, adult respiratory distress syndrome. As previously mentioned, coinfecting pathogens transmitted by the same tick bite must be considered. Coinfections may produce more severe clinical manifestations and may contribute to higher mortality rates. Many Babesia infections are subclinical and are discovered incidentally. Babesiosis should be suspected in patients with mild, nonspecific symptoms who have recently visited endemic wooded areas and report a tick bite. Babesiosis should be considered in patients who have recently received an RBC transfusion. Babesia species, like Plasmodium species, may also be transmitted by this blood product. The symptoms of babesiosis are nonspecific. Therefore the definitive diagnosis of babesiosis is made in the laboratory. As for the detection of Plasmodium species, thick and thin blood smears are used for the detection and speciation of Babesia species. The thick smear allows for the more rapid screening of greater quantities of blood. This is important because low-grade parasitemia may be present in Babesia infections. Species determination is often suggested by the species endemic to the geographic area of exposure. Organism morphology, particularly size, is important for speciation. These should be examined in thin blood smear preparations. In some instances, the differentiation of Babesia species from P falciparum may be difficult. 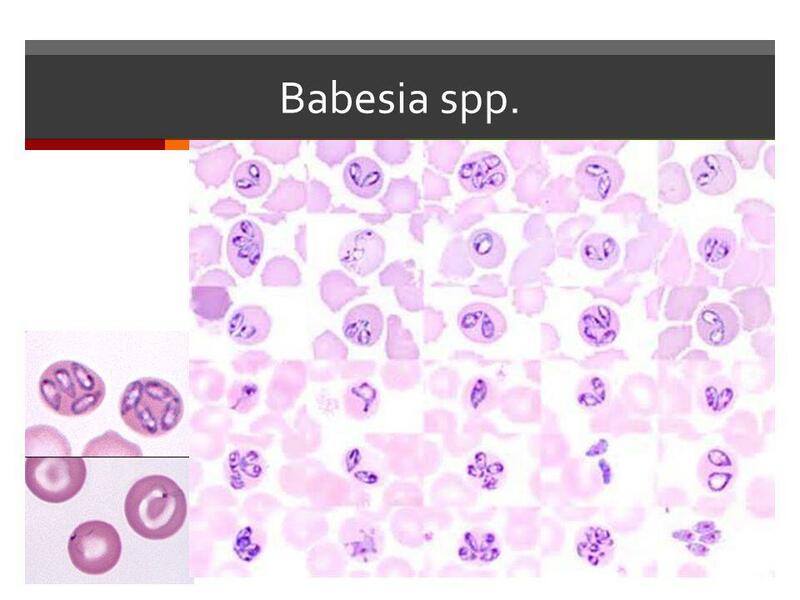 When only small ring forms are present in a blood smear, a Babesia species must be differentiated from a Plasmodium species, particularly P falciparum. The absence of hemozoin pigment and applique forms supports the identification of a Babesia species. Unfortunately, hemozoin pigment may also be absent in erythrocytes containing young plasmodial (ie, ring) trophozoites. Babesia species may also be excluded if the characteristic crescent-shaped gametocytes of P falciparum are identified. Similarly, malaria is excluded if the tetrad of merozoites, pathognomonic of Babesia species, is identified. Probably most important is historical information, such as a history of travel to an endemic area and exposure to the appropriate tick or mosquito vector. In most instances, the combination of history, clinical presentation, and morphologic features is sufficient to establish the appropriate diagnosis. In difficult cases, molecular methods may be used to differentiate these organisms. The histidine-rich protein 2 of P falciparum may be detected in whole blood by ELISA, and species-specific nucleic acid may be detected for either organism by PCR. Mild Babesia infections in immunocompetent individuals usually resolve without antimicrobial therapy. In cases of severe disease or in immunocompromised patients, the combination of clindamycin and quinine is the treatment of choice (Box 5). The clindamycin may be given orally, intravenously, or intramuscularly. Intravenous quinidine may also be used. The vast majority of patients infected by B microti have subclinical infections that usually resolve without incident. The prognosis for immunocompromised individuals and the elderly is guarded, because these patients may have a more severe course. Patients who are coinfected with B burgdorferi carry a worse prognosis than do patients infected by either organism alone. Prognostic information is not available for infections caused by the WA-1 agent because so few cases have been reported. Splenectomized patients who may be infected by B divergens in Europe have a grave prognosis. The avoidance of outdoor activities in tick-infested, Babesia-endemic areas is the most effective means of prevention (Box 6). If avoidance of these areas is impractical, tick repellents should be used, and appropriate clothing should be worn. After leaving tick-infested areas, one should perform a thorough body and scalp search for ticks.